Were freezing here in America, how bout you guys? Re: I thought this was funny! Hehe! So true. While it hasn't been too bad here recently, we're now heading into a week of extreme heat - blerk! How are you coping with the cold Terri? It was actually nice today! 35 degrees! I was shoveling in short sleeves!!! My Canadian friend was saying how the American Polar Vortex is what Canada is like all the time in Winter lol. i beleive that! i used to live farther up in Michigan, and was 5 mins form Canada, and we got much more snow that i do now, way at the bottom of my state, hours from Canada. LOL @ that pic - very true! 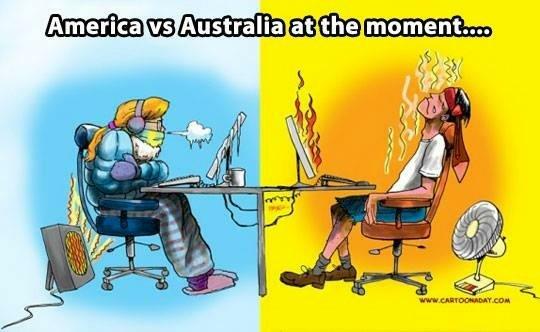 We just had a week of 40+ celcius and it was BLOODY HOT!!!! !